It is a kind of monosaccharide, and is soluble in water with slight sweet. The energy released from its oxidizing reaction is a main source for human life activities. Glucose content, (on dry base) % : ≥ 99.5. In the food industry, Dextrose Monohydrate is used in the production of baked goods, candy and gum, creams and frozen dairy products (like some ice-creams and frozen yogurts), jarred and canned foods, cured meats and also energy drinks. It’s also a common component of complete nutrition drinks and infant formulas. 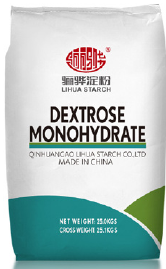 Interestingly, Dextrose Monohydrate has preservative properties and is often used in fruit and vegetable processing to help keep them fresh. It’s also used in dehydration.